All across America people are mobilizing to fight human rights abuses which are intensifying under the Trump administration. In this issue of Human Rights Now! 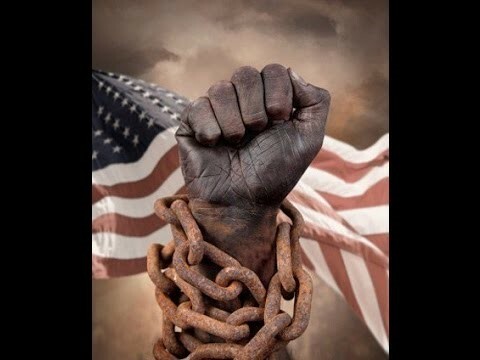 we feature articles about efforts to fight police militarization, abuse of prisoners, abuse of the homeless, abuse of immigrants, and the emboldening and expansion of white supremacy. 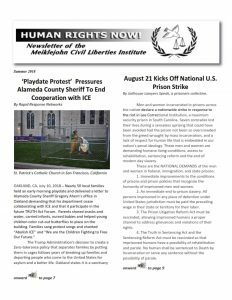 This issue also provides information about how we can fight back by joining these movements and becoming more involved with the Meiklejohn Civil Liberties Institute. Many of the human rights abuses outlined in this issue were mentioned in the MCLI Shadow Report submitted on June 4, 2018 to the U.N. Committee on the Elimination of Racial Discrimination (CERD). However, CERD has not responded to this Report, and have indicated that they will take no action until they have received the U.S. report. This is despite the fact that the Trump administration has no intention of submitting a report or accepting international scrutiny. By ignoring these reporting requirements under the International Convention on the Elimination of All Forms of Racial Discrimination (ICERD) the Trump administration is avoiding accountability for their racist policies and rhetoric. The U.S. should not be allowed to avoid scrutiny of its violations of ICERD by refusing to submit a report. MCLI has demanded that CERD should initiate a monitoring process and review shadow reports in the absence of the Trump administration’s cooperation. Further, the U.S. report to the Committee Against Torture (CAT) is due this November. MCLI has been mobilizing against the criminalization of homelessness which is a violation of the International Convention Against Torture and All Forms of Cruel and Unusual Punishment (ICAT). We are reaching out to allies working on prison reform and prison abolition to expand our efforts as we prepare to fight torture and cruelty. We have an opportunity to use the numerous reporting and monitoring processes occurring now and in the next few years to translate the grievances of emerging social movements into reports to international monitoring bodies as part of the “mobilization of shame” for the many human rights violations occurring today in the United States. To that end, MCLI is working with the National Lawyers Guild (NLG) to organize the Workshop on the Human Rights of Children, Parents and Families at the NLG 2018 Convention in Portland, Oregon October 31 through November 4, 2018. For information about this event go to the NLG website. MCLI needs your support. We are currently seeking volunteers and interns able to work with us at our office in Berkeley. If you want to volunteer then contact us at mcli1965@gmail.com. For more information about our fall internships opportunities check out our posting. Spread the word to students and recent graduates interested in human rights. MCLI also needs your financial support. We are beginning MCLI’s Fall Fundraising Drive. Our goal is to raise $5,000.